Looking to install a new garage door? Prosco can help you figure out how much this will cost you, and connect you with some of the best garage door companies so you can compare quotes. Choosing a new door for your garage is not an easy task. Whether you are in the process of remodeling your home or upgrading your garage, you will need to prepare yourself for some hassle. Garage doors are found in a great variety of models, sizes, and price ranges. They can run from a few hundred dollars for the simplest models to thousands of dollars for high-tech doors installed by professional technicians. So it's a decision you will want to ponder upon. However, the good news is that by purchasing a new garage door, you will be making an excellent investment. The return on investment appears to be higher than any other home improvement project. If you want to know how much a garage door costs, the information within these next few lines should come in handy. How Do You Know You Need A New Garage Door? If you are the owner of a wooden garage door, chances are you have started to notice signs of rot. But a metal door can also pose problems, as it can get damaged due to track hardware falling apart. These are two of the most common examples of issues that require the replacement of old garage doors. However, at times, a broken door can still be salvaged with small repairs that can be done as part of a DIY project at home. Proper maintenance work can also help cut the repair or replacement costs. If you have never hired professional technicians for your garage door needs, Prosco can direct you toward the best-fitted companies to cater to your patching needs. There are also times when some models can be completely transformed with a simple paint job, once again avoiding to pay a high garage door price. One of the determining factors for establishing the final garage door cost refers to the materials used in the manufacturing process. There are lots of different materials that can be used in the process, and each comes with its own advantages and drawbacks. Steel doors are the most popular option, as they are affordable, sturdy, and require little maintenance. They can also be found in a variety of styles, and you can always get creative and paint them any color. There are even textures that imitate wood. Garage doors made of aluminum are similar to steel doors in many ways, but they also offer the chance to choose from a long list of finishes. It is also cheaper than steel, but you may deal with more dents. Wood doors will give your garage a more traditional look. They also come in a great number of styles and models, and they can also feature windows. You can opt for stain-grade wood doors or painted wood with flat hardboard panels and add more curb appeal to your property. Another advantage of garage doors made of wood comes from the fact that wood is an excellent insulator, better than steel. You will, however, need to allocate a lot of time to maintenance. Wood composite and fiberglass garage doors will also add to the final garage door price tag. A wood composite garage door will help you follow the eco-friendly trend. The manufacturing process relies on recycled wood fibers that make these doors as sturdy as their steel counterparts. They also do a better job dealing with splitting and rot. Ask your garage door technician or a hardware employee all about the pros and cons of each of these materials, and make your final call. Keep in mind the style you will also ultimately influence the price. Also, if the old tracks need replacement, you will also need to dig deeper into your pockets. Shop around and compare different products so you can get a full picture of all of your alternatives. 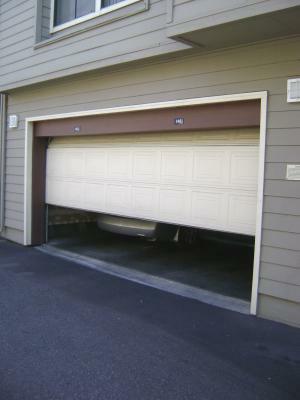 If you live in a big city, you should be able to find a lot of services that handle the installation of garage doors. Pick their brain and see what kind of materials and styles they recommend to you. Get written estimates and consider installing your new door yourself. There are certain models that are simple to install. You may need to get in touch with the manufacturer for some additional instructions. Most companies will have no problem assisting you over the phone or via email. This is one way of saving money on your new garage door. However, for models that are more complex, you should consider hiring expert technicians who are insured and experienced. Avoid any complications and improper installation problems by having someone whose work is to fit garage doors throw you a hand. Do You Need To Replace Your Garage Door Opener? More often than not, old garage door openers will work just fine with the newly fitted doors. However, at times, when looking at doors that are heavier than the old model, the opener might fail to effectively handle the additional weight. You are either advised to buy a lightweight door for your garage or have the old opener replaced as well. Prosco can connect you with the most reliable technicians that can assist you with your garage door or garage door opener/remote needs. They will answer all of your questions and concerns and help you remain within your original budget. They can guide the measuring of your door- step by step and make sure you receive a realistic estimate of the final costs of your garage door.